From the last post I said that I would research into Dyslexia and how people who suffer from it, see a library. After a chat within groups with lecturers about our work I was told that I shouldn’t really focus on dyslexia because it was too narrow and I was just finding an ‘easy’ route to create work. At that point when I thought I found a solution and was told the opposite I wanted to break down and say what do you want from me! However, I did not do that as that wouldn’t be very unprofessional and I would look like silly billy! Instead I am going to try and channel this confusion and uncertainty into my work and hopefully improve it. 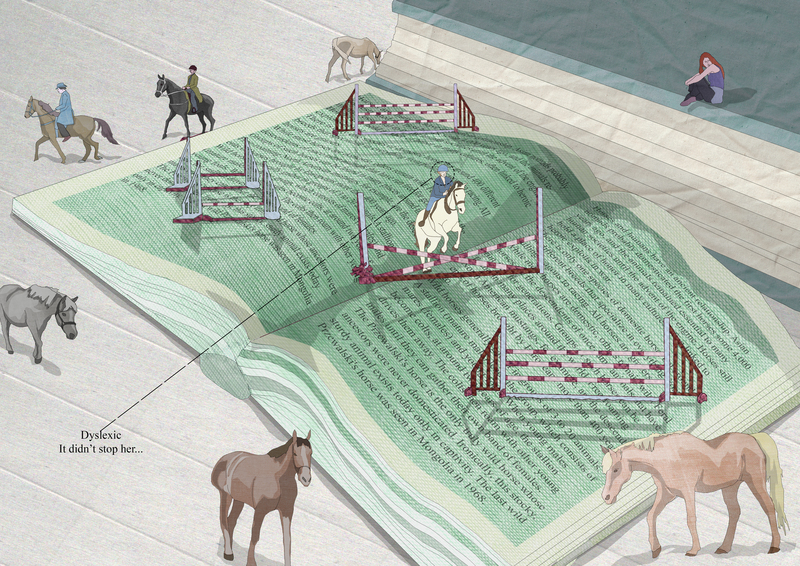 Horse jumping on large books, showing anyone can be who they want to be even if they are Dyslexic it shouldn’t stop them. Ok, I can’t really think of anymore. Now I know what my strengths are I can hopefully use the to improve my images, I don’t know how but I guess I’ll know when I get to it. Looking back maybe I was narrowing down my options too much and using the word frustration is large enough to experiment but not too large I have no clue. I think because I am used to getting a brief and then illustrating whats there or exactly what they want e.g. 2 final A4 finals, this new way of thinking i’m finding really hard to adjust to. What I really want to do is illustrating children’s books and I think I’ve got to find a way to link the word frustration and sequential illustrations so that I can improve my way of working and tackling new future projects. So I am going to start with creating a large mind map with frustration in the centre of it. This entry was posted in Re-Think!.